Tina's Crop Shop: PCC218 Tic-Tac-Toe Challenge! Hello! Happy Wednesday! I'm back over with the Paper Craft Crew today with my version of this fun Tic-Tac-Toe Challenge. I decided to go straight down the third row with Embossing, Favorite Holiday Color (Red/Turquoise Combo) and Animal. 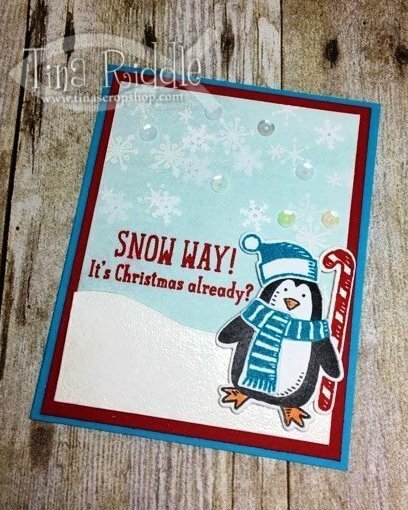 I pulled out a super fun set called Snow Place from last year's Christmas Catalog that returned to the Annual Catalog so yep, it's current, Yay! Some of the snowflakes in the background were heat embossed and some are snowflake sequins that I had in my stash. I added a few white and iridescent sequins as well with my Fine Tip Glue Pen. I also heat embossed with hill but running the Versamark pad over the hand cut slope and then pouring white embossing powder over it and then heating it until the entire piece was embossed. I actually did this twice to get a better shiny white coating on it. I just love the Red and Tempting Turquoise combination for Christmas. PCC #221 - Color Layering Cardinal and Barnwood! SIP Challenge #76 - Embossing! SIP #75 - Color Challenge! SIP Challenge #74 - CAS Christmas! OSAT Blog Hop - Let it Snow! SIP Challenge #72 - Sketch Challege!